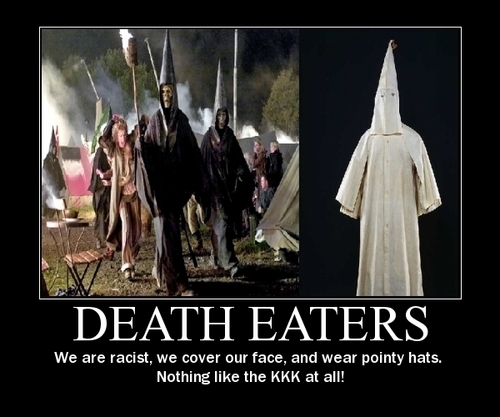 Death Eaters and the Ku Klux Klan. . Wallpaper and background images in the ハリーポッターｖｓトワイライト club tagged: series harry potter death eaters kkk ku klux klan funny. I read that they are actually supposed to resemble the KKK as Harry Potter has a back story on Racism (just a pointless bit of information). They were this racist group in the US. And I read somewhere that they were supposed to resemble Hitler and the Nazi's....maybe both? They both resemble each other, strangely enough, and I think that was suppose to be on purpose as they are both anti-something societies, anyway, I'd sooner dress as a KKK member than a Deatheater, their costume is hideous, but they are both evil. Am I the only one who think the KKK look like retarded ghost with pointy heads. Lol. I remember seeing this in the theater. I didn't know the KKK,but it reminded me of my dad watching "O Brother Where art Though" and I got freaked out.